Now that my Mikrotik router is up and running, I turned my attention to a side project I had in mind for the USB port it boasts. I have some data SIM cards courtesy of Three UK – they had (have?) an offer going where you can get 200MB of data per month with no ongoing cost (but obviously you need to pay up to top up). Armed with this and a cheap USB 3G/4G modem, one could arrange for a back-up cellular internet connection on the Mikrotik, ready to switch over to in the event of an outage on my main BT connection. To be fair to BT (and EE before them), I’ve not had a single outage in the four years I’ve lived here, so this is mostly a learning exercise and a bit of fun. Based on the supported peripherals page, I found a Huawei E3772 on eBay. It was only after receiving it that I dug into the forums and read about how there are two variants with the same model number, and mine (the E7732h) operates as a router, meaning you end up behind double NAT when connecting it to the Mikrotik, rather than getting the IP address Three assign on the LTE interface. This is a bit sad, but contrary to reports on the forums, the E7732h does work with the Mikrotik (without any of the extremely painful sounding flashing of firmware). I plugged it in, it appeared as an LTE interface. The trick is to ignore the word “minimal” on this screen, which doesn’t mean (as I incorrectly assumed) that it’s all broken. It just means the modem and Mikrotik don’t support rich functionality like scanning for networks. 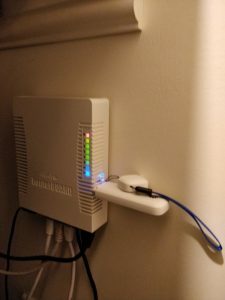 On the other hand, once you have the APN set correctly (“3internet” – get it from the E3372’s web page when plugged in to a Windows laptop), you can add a DHCP client to the LTE interface, and the Mikrotik will take an IP address behind the dongle’s NAT. This client should have a default route distance of 2 to ensure your primary internet link is preferred. Result! Of course, it’s a bit sad that the double NAT means no hope of monitoring the cellular interface from the outside, or straightforwardly logging in via it. But I have a cunning plan in mind to alleviate that which will be the subject of another post. This entry was posted in SysAdmin on February 2, 2019 by David North.